It is likely that Rinpoche will teach at His centers in Mongolia and Hong Kong in September, and then will teach at the Kopan November course towards the end of this year. 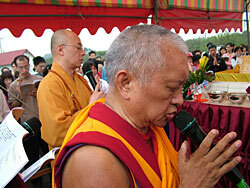 Rinpoche is scheduled to teach at Root Institute, Bodhgaya, India in early January 2008. Recently some students have been enquiring about Rinpoche’s health – when asked about practices which students can do for Rinpoche’s health and long life, Ven Roger Kunsang replied: “HARMONY HARMONY HARMONY”. Ven. Roger also consulted with Choden Rinpoche in mid-May and pujas have been done at Kopan for Rinpoche’s health as advised. 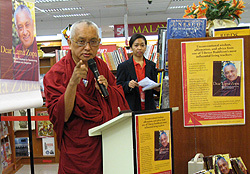 Lama Zopa Rinpoche at book launch party in Malaysia. 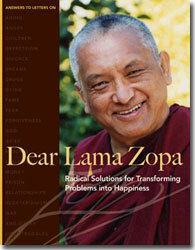 Dear Lama Zopa: Radical Advice for Transforming Problems into Happiness, the much anticipated compilation of Rinpoche’s advice, is now published by Wisdom Publications and available at the Foundation Store. Every year Rinpoche receives thousands of letters from people around the world asking for advice on coping with everything from addiction, grief, and depression, to war, terrorism, and death. In his detailed and deeply caring responses to these letters, Rinpoche shows again and again that the best method for solving our problems is to radically change the way we perceive them; that by emphasizing their inner causes we can even change the resulting outer circumstances. This book is such a great resource for us all, and its release warrants plenty of local celebrations so we strongly recommend you to try to fulfill Wisdom’s suggestion to host a “Dear Lama Zopa” party at your center. Think of it as a book-club-style party, where members and friends can get together, purchase copies of the book, and read and discuss Rinpoche’s guidance on the pages inside? Gather round, serve refreshments, and share the Dharma! This is a book that your center’s visitors will want to know about. And, as it explains Rinpoche’s views on so many issues, it should prove useful when trying to explain karma and transforming problems to friends and family who may not yet have an understanding of Rinpoche’s surprising and inspired style. For more information on hosting a book launch party, contact Claire. Lama Zopa Rinpoche has urgently requested that all centers and individuals in FPMT who are making stupas and tsa-tsas receive advice on the proper mantras to be included when filling stupas and statues. Rinpoche says the Four Dharmakaya Relic mantras and the Zung of the Completely Pure Stainless Light mantras are essential and must be included in every holy object. In addition, Rinpoche has elaborated upon the Four Dharmakaya Relic mantras and also given the first teaching ever on the Great Wisdom mantra, which is essential for blessing materials for stupas and the powder for tsa-tsas, in addition to blessing completed holy objects. All centers who are involved in stupa and tsa-tsa making have been sent this information personally from FPMT Education Services. In addition, a announcement will go out via the e-groups providing more information and links to this amazing new advice! Watch your inboxes! All statues and stupas should contain the Four Dharmakaya Relic mantras. The Four Dharmakaya Relic mantras are what give power to stupas. Their benefits are inconceivable. Bigger stupas should contain 100,000 copies of the Stainless Pinnacle Deity mantra (one of the Four Dharmakaya Relic mantras). Other smaller stupas should contain as many of these as possible. The new corrected version of the Four Dharmakaya Relic mantras (prepared by Lama Zopa Rinpoche) have been formatted for rolling and are available for free download on the FPMT website. Rinpoche prefers this version to be used. Clay and powder for making tsa-tsas and the building materials for stupas should be blessed with the mantra of Vairochana and the Great Wisdom mantra. A meditation on Vairochana to use in this case has been given by Lama Zopa Rinpoche. “Up to now what we have been able to accomplish, benefiting this world in various ways is I think basically through the kindness of the guru: His Holiness, who is the only object of refuge of all of us sentient beings and the originator of all us sentient beings’ happiness. And then secondly the founder of this organisation, Lama Yeshe, whose holy name is extremely rare to mention, who is kinder than all the three time buddhas. And the kindness of many other gurus. So what we have been able to accomplish so far depends on how much guru devotion practice we did correctly, it is the result of that. “As a director of a Dharma centre you face a lot of things that hurt your ego. This is a great challenge for your practice. When you live in a cave or a tree you don’t see much of your mistakes, you think, “I’m a good person with no delusions”, but still the mistakes are inside. Being director at a centre, so many people are like a mirror teaching us (not from books), forcing out your pride, jealousy, anger, so you see what has to be purified, you have to apply the antidote. It’s all showing what impurities you have, the suffering that we have. It’s like a dirty cloth. When a dirty cloth is cleaned with water not much dirt is seen, but when you add soap it makes the dirt come out. That’s good! 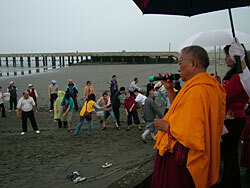 As we reported in the last issue of the Lama Zopa Rinpoche Newssheet, on the Day of Miracles, Rinpoche was invited to participate in a large animal liberation conducted by Chinese Master Hai Tao. 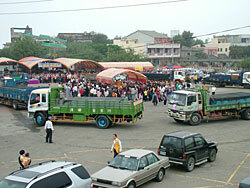 More than a thousand people attended and released 10 big truck loads of fish – 160,000 fish. 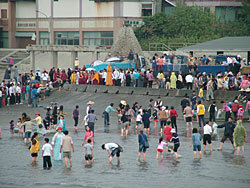 Before the fish were released, they were driven around a central canopy under which Rinpoche and the participants stood chanting and praying, gathered around many holy objects and texts. Here are some pictures of that event. 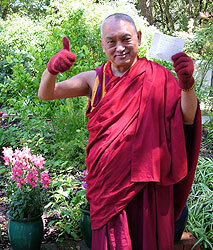 A card written by Terry Leach shortly before he died and a gift of a pair of gloves were hand delivered to Lama Zopa Rinpoche by Khensur Jampa Thegchog. Thank you so much for manifesting Buddhahood to me and so many beings in this, past and future lives. You have made my life truly meaningful. I have not long to live now. 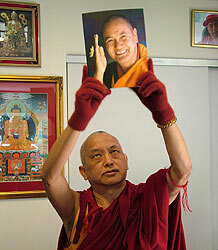 I was most fortunate to be able to take Rabjung vows with Khensur Thegchog Rinpoche and now is even more meaningful. I pray from the depths of my heart that I will always be close to you during death, the bardo and all future lives and that I will always be a close student to you so that I can benefit all beings. 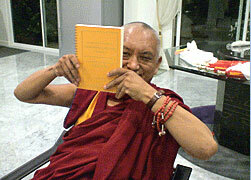 Lama Zopa Rinpoche with the newly printed English translation of the Sutra of Golden Light.